Seriously? OMG! WTF?Simon Cowell Archives - Seriously? OMG! WTF? When will America’s Got Talent be back? We know that America’s Got Talent changed it up this season, but when will we see those changes? NBC announced today talent competition show will return on May 28th. 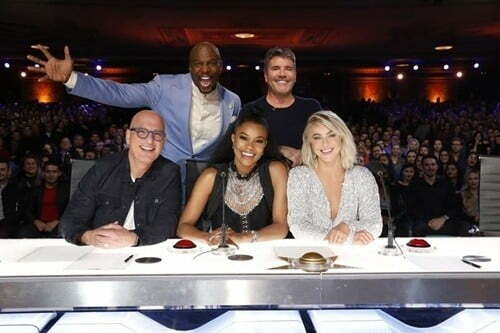 That is when we will find out if the new judges, Julianne Hough and Gabrielle Union, work well with Howie Mandel and Simon Cowell and new host Terry Crews. I think it will be interesting because we know that Hough doesn’t like to share the spotlight and neither does Cowell. Since it is the latter one’s show, I think we know who will win out. You know how they say, if it is not broke, don’t fix it. America’s Got Talent never heard of that. That is because for season 14, they are changing things up again. Out are Heidi Klum, Mel B and Tyra Banks, in are Gabrielle Union, Julianne Hough and Terry Crews. The Brooklyn Nine-Nine actor has been well received as the host of AGT: Champions, so his hiring makes sense. As does the departure of the three ladies who are working on other projects. What I cannot get into is Hough joining the panel. Who doesn’t find her annoying? I am sure Simon Cowell will find out soon enough that she thinks it should be all about her. On a positive note, at least there are Americans on the panel again. The first time there has been one since Howard Stern left after season 10. What do you think of the new America’s Got Talent? Is Simon Cowell a member of the mile high club? Simon Cowell is on Ellen today and Ellen DeGeneres asked him a lot of burning questions. The last one being, Are you a member of the mile high club? Without much hesitation, he said, “It wasn’t quite a mile.” It takes a real man to admit that. The King of Mean also admitted that he does not watch any reality shows he is not on. Can anyone say that he is missing out? When it comes to his son Eric, he is going to be just like his dad. That is because the two of like to look in the mirror at the same time to say how handsome they are. Did you expect any less from him? Simon Cowell’s son is the star of his interview with Loose Women! Now that Eric Cowell is 4 years old, his dad, Simon Cowell, takes him everywhere with him. Including today, when he brought him along for his interview with ITV’s Loose Women. Before the show, Eric drank a little too much of the “annoying juice”, so his father told him to hang out in the green room after he started tickling him. Then after a few minutes, the toddler came back and he had something with him. A clothespin that he snapped on his dad’s nose. Instead of yelling at his mini-me, he laughed the pain off. As the interview went on, we learned that the little guy is the true star of the family and his dad is no longer the King of Mean! Does the proud pop want his son following in his footsteps and go into the entertainment industry? Yes, but only behind the judges’ desk and not in front of it. Something I think he is ready to do right now. You know, Cowell should give him one like Got Talent Junior! I would actually tune every week to see him show his pops how it is really done. Did Howie Mandel push Simon Cowell down the stairs? On Friday, Simon Cowell was rushed to the hospital after he fell down the stairs at his house. He says that it might have been because he has low blood pressure and that caused him to faint. But this photo seems to tell a different story? It looks like Howie Mandel is the real cause. Which makes you wonder if he is trying to get rid of his boss, so that he can have a bigger role on America’s Got Talent? Or just cause? When I saw this photo, I felt guilty laughing. But I still laughed. Did you laugh too?